Summer time is here again, and that means freedom! Exotic vacations, family reunions, no homework, sleeping in, video games, and, of course, summer camps. But dedicated music students don’t want to stop when summer hits, so Boise State provides a camp just for them in the form of the BSU Summer Chamber Music Camp. This was my second summer teaching at the camp (check out my first summer camp post here), and it was even more rewarding than the first. This year, I had Amanda at my side, and our goal was to take these ten eager, young flutists and give them the tools they needed to become even better performers and collaborators. We had tons of fun, as per usual, and our activities ranged from fundamentals classes, chamber rehearsals, and workshops to core workouts, iRest, and performances. Each morning after stretching (stretching is super important – don’t forget! 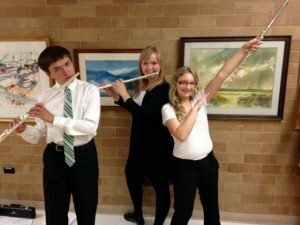 ), we focused on a particular aspect of flute technique, such as breathing, body/hand position, embouchure, tone, rhythm, scales, or articulation. 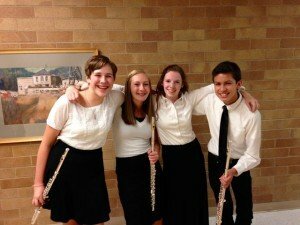 The second flute hour was dedicated to chamber ensembles. We divided our flutists into three groups (2 trios and 1 quartet) and assigned them appropriate music to work on throughout the week in preparation for the Friday afternoon concert. One group tackled arrangements of “Dance of the Hours” from the opera La Giaconda (maybe you recognize it from Fantasia or the K9 Advantix commercial) and ballet music from Orfeo by Christoph Willibald Gluck. Another trio embodied the flirtiness of Gilbert and Sullivan’s “Three Little Maids From School Are We,” while the quartet conquered something completely different in the Slovenian music of Blaz Pucihar’s Suite to the Youth. Not only did we learn our notes and rhythms, but we also engaged our audience musically with beautiful phrasing, dynamics, articulation, and choreography. Yes, you read that right – choreography. We incorporated some movement to convey our ideas on a visual level to our audience, making it even more accessible and entertaining. The third flute hour was usually dedicated to special workshops. Some of our workshops included Amanda’s talk on injury prevention, Dr. Molumby’s Dalcroze Eurhythmics and core inspired movement class (complete with bouncy balls and balloons), and a performance by the BSU flute quartet. The BSU quartet took a couple days to prepare Catherine McMichael’s A Gaelic Offering, which is a fantastic flute quartet with lots of Irish/Scottish influence. We used our performance as an example of professional-level chamber playing and had a great Q&A session after the performance with the chamber campers about how a chamber ensemble functions in rehearsals and performance. 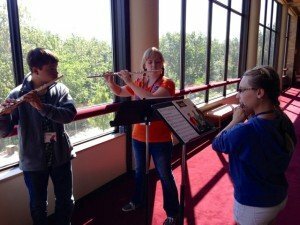 When our students were not in flute class, they were kept plenty busy with music appreciation (camp composers this year were Frank Ticheli and Duke Ellington), music theory (some were lucky enough to be in my theory class), camp choir, orchestra, jazz improvisation, rec time, and evening activities. On Wednesday night, the evening activity was the faculty concert, in which Amanda and I played with the fantastic Peggy Purdy. 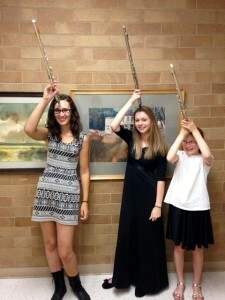 All three of us performed Sean’s Dance by Jennifer Grady, which is for two flutes and piano. See our performance below of this beautiful piece. Playing music together and having fun doing it were the main points of this camp, and we hope these flutists learned these things and perhaps more than they ever expected to about flute, music, collaboration, practice technique, and performance psychology. I know I had a lot of fun and learned plenty in return from working with these great students. 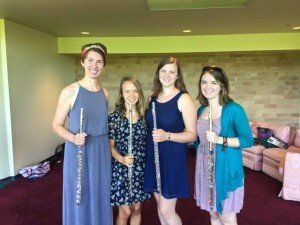 I hope to continue teaching at this fantastic camp and see even more flutists next summer!